The LX850 features DC-servo motors on each axis with a maximum slew speed of 3 degrees per second, allowing slewing 180 degrees to the opposite side of the sky in one minute flat. Fine slewing and photographic guiding speeds can be adjusted from .01x to 1x sidereal, with faster slewing at 2x, 8x, 16x, or 1/4, 1/2, 1 or 3 degrees per second. 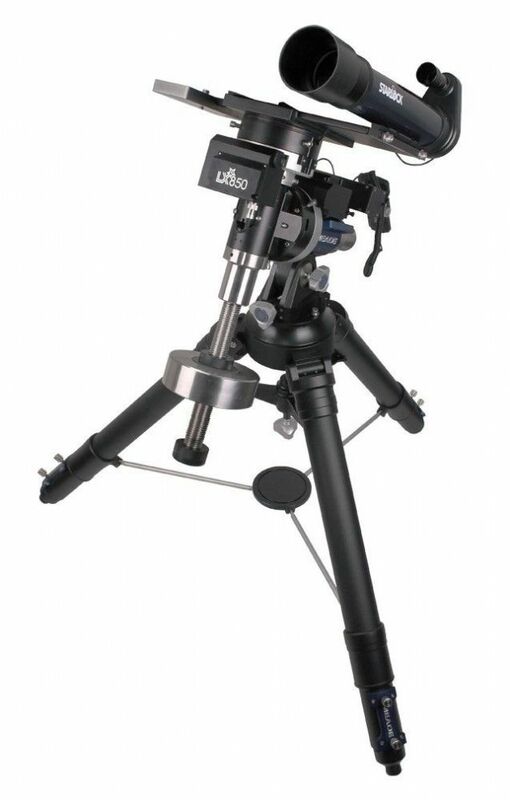 The mount and all electronics are externally powered by the included Meade Universal Power Supply (12V). An external DC battery or power pack may also be used; Meade 607 Power Cord sold separately. The mount includes both mechanical locks and slow motion manual controls in both axis if for some reason you found yourself without power. Includes single 26 pound stainless steel counterweight, additional weights sold separately. LX800 mount shown in photo, LX850 mount similar. Total Instrument Capacity 90 lbs.